Cap'n's Cabaret #91: Baltimore Buzz! Catch the Buzz: it's all about the Baltimore! Cap'n's Cabaret #90: Dancin' in Charleston! They're doing it in Manhattan, they're doing it in Paris, they're doing it in Shanghai...care to do it with me? Hike up your skirts, ladies and kick up those heels, 'cause here we go! Welcome to Two-Fisted Tuesdays, where we throw on our trench coats, don our fedoras, and walk down the mean streets of classic crime fiction. Miskatonic Monday - Oh Yeah! Cap'n's Cabaret #89: That's It...Flying Boats for Me! What could be better than a nice trip on a fancy steamship or the thrill of flight? How about both at the same time? 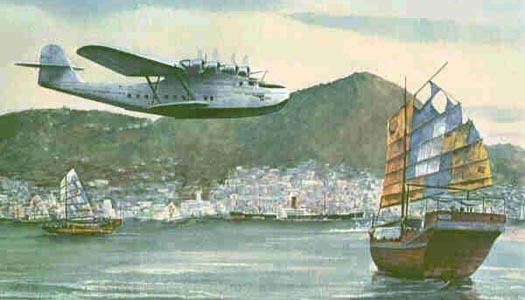 It's the Flying Boat, the miracle of the skies that takes you where no other aircraft...or ship...can! 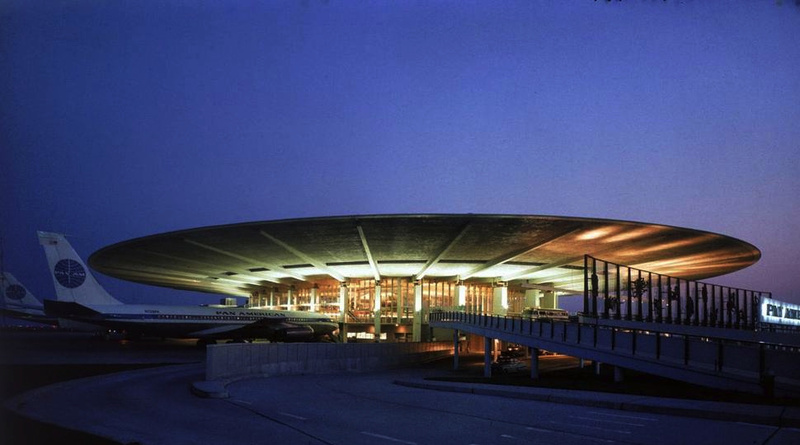 Sad News for Atompunks everywhere: the glorious Googie-style Pan Am Worldport(TM) terminal at JFK International Airport in New York is being demolished. In Germany, a few weeks ahead of the election of the Federal Parliament, streets have started to fill with election posters of the political parties. As usual, the communists of the MLPD (Marxist-Leninist Party of Germany) provide their 1930s style totalitarian art. The poster below, I photographed today on the street next to my office. It shows the front end of a Soviet type steam locomotive (maybe an IS-20) and the Karl Marx slogan "Revolutions are locomotives of history." Cap'n's Cabaret #88: No Gin?!? Oh, the Humanity!! Zeppelin Airships...the only way to fly! With their exquisite comfort, perfectly smooth ride, graceful beauty, and impressive safety record, it seems obvious the days of the passenger airplane are numbered! The ePulp Sampler will be e-Unearthed! This new action-packed ePulp anthology unleashes five tales inspired by the pulp magazines of the 1920s - 1940s. They are not for the faint of heart! Things will get intense. The words on these pages cannot be unread! The Volkswagen Type 2, known officially, depending on body type as the Transporter, Kombi and Microbus, shown here in service with the Deutsche Afrikakorp, DAK, early 1942. Used primarily for reconnaissance and convoy supply, it saw a great deal of service throughout the North African campaign. Later it proved popular with Surfing enthusiasts! Cap'n's Cabaret #87: Vanished Into Thin Air!! America's flying sweetheart Amelia Earhart and her navigator, Fred Noonan, disappear into thin air over the South Pacific! Well, here it is August already, as another year goes racing by. So, as I broil and bake under the searing California summer sun, I'll do the logical thing— turn on the heat. With the August Pilsner's Picks, that is. So, take it away, Jack Hylton's Rhythmagicians!